Dragon tattoo sci fi girl with futuristic outfit, Mohawk hairstyle and glowing abstract background. A white, turquoise and blue backdrop with glowing light effect enhances this modern digital art image. Dragon tattoo sci fi girl with futuristic outfit, Mohawk hairstyle and glowing abstract background. A white backdrop with glowing light effect enhances this modern digital art image. 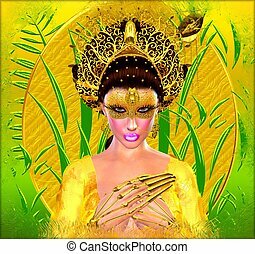 Asian princess with gold crown against a gold and green background. 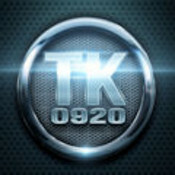 Modern digital art beauty, fashion and cosmetics. Asian fantasy art. 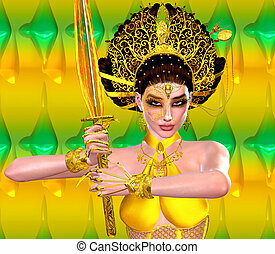 Asian princess with gold sword against a gold and green background. Modern digital art beauty, fashion and cosmetics. Asian fantasy art. 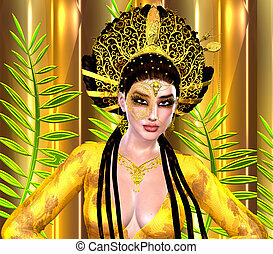 Asian princess with gold bra and crown against a gold and green background. Modern digital art beauty, fashion and cosmetics. Asian fantasy art.